Although people tend to search for 'running headphones' (or 'headphones for running'), what follows is also a list of the best headphones for gym, work outs, sports, cross-fit, cycling and fell trekking, as well as running. Whatever your activities of choice, these buds and sports headphones will soundtrack your path to fitness. That's because they resist sweat, have Bluetooth wireless convenience and a fit that can stand up to the movement inherent in running, gym workouts and other physical jerks. What are the best running headphones and headphones for the gym? My first advice for picking the best running headphones is this: go true wireless. There are several true wireless bud options for the gym – think Apple Earbuds, but more robust and sweatproof. I know a lot of you reading this will think, "no way, I'm not an early adopter and they're too expensive." However, you are bang wrong: once you get used to having no wire at all rubbing on the back of your neck and no snagging on things ever, it is bloody hard to go back to the more traditional styles of running/gym headphones. I also feel that the various limitations of true wireless, which make them irritating to use as full-time buds, just don't apply if you only run, ride or work out in them. The battery life is invariably short but it’s more than long enough for gym and running, at least for anyone who's not doing ultra-marathons. The usually slightly poorer sound quality is also less important for pumpin', workout-style listening. Obviously, if you work out to Nick Drake, it'll be more of an issue, but I think you may be in a minority, there. True wireless is still in its infancy as a product category but already some clear leaders have emerged: Jabra Elite 65t are THE best, while RHA's splendid TrueConnect offers a more comfortable fit and less bass-heavy sound than the Jabra pair. However, those who prefer the old-fashioned, considerably more affordable route to a sweat-soaked soundtrack should get a pair of NuForce. About 18 months ago, I said the Optoma NuForce BE Sport4 is the best pair of Bluetooth headphones for running and gym. Now, in 2018, they remain comfortable, they still sound excellent and still they're very light and well weighted. The battery life of 8-10 hours is alright, too. If you prefer headphones that let through sound from the outside world (for instance, a double decker bus bearing down on you at 30mph), go for the Urbanears Stadion. I know that brand usually turns out hipster-friendly basics, but these are impressive. A decent pair of sports headphones are a very worthy investment. Research has shown that the right type and tempo of tune can keep you in the zone for longer, and we've all run up park steps to a suitably bombastic soundtrack like we're Rocky. Even if we've then keeled over at the top. There are four things to look for, really. 1. Waterproofing. Although a 'normal' pair of headphones can work well for exercise, if they fit well enough, they're just not built to stand up to heavy rain when running or, more importantly, sweat when doing any exercise. And sooner or later, sweat or heavy rain will find them. And it will kill them. All the headphones here are sweatproof and rain resistant, but not suitable for immersion (ie: swimming, or running in Manchester). 2. A secure but comfortable fit. You can get all sorts of fitness-oriented designs that wrap tightly around your head, over and around your ears, and then deep into your cranium. However in my experience, the best types of running headphones are actually either true wireless or lightweight Bluetooth in-ears with tips that go into the ear as usual, but with additional, curved, tapered 'hooks' that sit under the antihelix of your ear. For those of you who aren't ear doctors, that is the crater of cartilage that sits above your earhole. Of that type, pioneered (I think) by Monster and Bose, the Optoma NuForce BE Sport4 are the best. 3. Decent sound quality. I don't want to overly generalise but really this is the least important element in sports headphones. Most people want to be able to hear/feel their tunes as they workout and be motivated by them, whilst blocking out the gym/the world. They don't necessarily want to be picking out hitherto undetected nuances in the string quartets of Brahms or the early works of Fleetwood Mac. So two of the headphones here sound really good and the rest sound good enough, usually with a lot of low-end and mid-range tones. 4. Situational awareness. This is all-important for some people, who feel that effectively deafening themselves leaves them in danger of traffic or muggers when road running. It's of no importance to me, as I prefer to shut out the world entirely when working out, but nonetheless I've included three great pairs of headphones specifically designed to let ambient sound through. Whatever the sound you want, there is nothing more annoying than ear buds worming their way out when you're trying to stay focussed. The main causes of this are poorly fitting ear-tips, plus the vibrations through your body and movements of your head as you run or work out. Even the best running headphones can become annoying when their cable snags on the back of your neck or your clothing. Okay. On your marks, get set, SHOP! If you're after the best true wireless headphones for running, Jabra's Elite Active 65t is your new workout bud. It's also great for gym workouts, cross training, cycling, spinning, rope thrashing and anything else where you get sweaty. Since I started using them, I would now not willingly go back to even the most minimally wired Bluetooth headphones, such as the Optoma below. For workout purposes the 65t sound great. At launch they sounded a bit 'off' but Jabra has honed the sound with a seemingly never-ending sequence of software updates since then. They're sufficiently bassy, great with pounding, workout-friendly music, and have a reasonable amount of musicality too. I've used them many times as headphones outside of a gym/run environment. There is actually an accelerometer in these, for counting reps and working in conjunction with Jabra's own fitness app. I don't recommend that – get a running/gym watch instead – but some people might find it useful. It's the comfortable yet unshakeable fit, and complete absence of wires that makes the Jabra Elite 65t so essential for workouts. Once you've tried true wireless, it's very hard to go back to having that wire joining your buds, snagging on your neck or running vest. One final note: this model, the Elite Active 65t, has a special coating so it 'sticks' in the ear a little better. Jabra's other model, the Elite 65t lacks that coating (there's also no accelerometer, but I'm not too bothered about that). As such, that's less recommendable if you work out outdoors, where there's a risk of them falling out and being lost forever – as, in fact, happened to me. It's otherwise a similarly excellent true wireless earbud. The BE Sport4 headphones takes the T3-Award-winning BE Sport3, which previously topped this chart since about 1987, and improves on it in several ways whilst maintaining the sub-£100 price tag. And so, naturally enough, it's our top-rated, non-true-wireless wireless headphones for workouts and running. These in-ear sports headphones with ear-hugging hooks are the best headphones for exercise that you can get at their price point. The only caveat I'd add to that is personally, I'd advise spending more and going true wireless with the Jabra Elite Active 65t. But then I'm a big-ticket guy. That aside, the BE Sport4 is great; easily good enough to use as day-to-day headphones, thanks to fantastic clarity, support for both AAC and Apt-X (giving improved audio quality on Apple and Android devices respectively), well-deployed bass and 10-hour battery life (up from 8 on the previous model). They also offer a very secure yet comfortable fit. Down sides? If you prefer to be able to hear the world around you whilst exercising – I don't – these might not be to your liking, because their noise isolation is very good. See further down this buying guide for some headphones that let more sound filter in. The choice of tips includes different size buds (so you don't have to use the slightly horrific-looking 'double-penetrator' pictured above) and in-ear hooks, which strike just the right balance of very good anchoring, without sacrificing comfort. The price is very reasonable given the quality of the Optoma NuForce BE Sport4. If you aren't ready to embrace true wireless, they're the best headphones for running and gym that you can get, and also a pair of headphones you can happily use when doing nothing strenuous at all. The first two options here are at least somewhat high-end, and tailored for those who value good audio quality. The Anker Soundcore Spirit Sports are a bit scrappier in the musical department, but easily as good when it comes to running and workout essentials such as sweat-proofing, secure but comfy fit and solid battery life, and they can be had for less than 30 quid. What can you get for 30 quid nowadays? Practically nothing! The killer features here, besides the value for money, are the excellent fit (at least in my ears, although a variety of ear tips mean they should work for most people) and the fact that they're not just sweat-proof but actually submergible in sea water. There's no little cover over the USB charging socket, as on most such headphones, because the socket itself is water resistant. The RHA TrueConnect look quite like Apple AirPods, and aren't a million miles away in terms of comfort. However, they go into your ear rather than sitting just outside, and have sweat-proofing for all your run/cycle/gym needs. What you end up with is a pair of running headphones that sound at least as good as the Bose SoundSport Free (#5), are just as workout-friendly, but look less peculiar, and are not as susceptible to wind noise. There's a lack of overt bass, but I've found there's enough to keep you motivated whilst listening to 'Techno Workout Playlist 57', and mid-range and treble sparkle more than on the Jabras. One way these £149 AirPods-a-likes are not like actual AIrPods is that pairing is very occasionally a bit clonky – if you return them to the case and try again, it tends to work second time. The case it self is a bit fiddly too, but again not enough to make the TrueConnect lose my love. Fit is obviously important with true wireless, and the RHAs are excellent in this respect because they come with about 15 billion choices of ear tip. They don't feel as super secure as the Jabra buds, but the flip side of that is that they're a little more comfortable. In the gym, they're perfect, although on the road you may find yourself at times nervously prodding them back into your ear holes as you pound potholed roads. Overall, these fall just short of Jabra's superb workout buds, but many punters will prefer their less intrusive fit and more musical audio. If the price starts to slide down below the Elite 65t, they'll become very attractive indeed. The way the Bose SoundSport Free buds protrude from your ears gives a look that is somewhat less than icy cool. But if you work out a lot, you probably value performance over appearance, and are well used to looking a tad 'off-beat'. And their is no doubt that at the gym, the SoundSport Free perform. Sonically, these are a better true wireless option than the slightly artificial sounding Jabra Elite 65t. Like them, they give you five hours of battery life, with 10 more hours provided by recharging in their case. A quick-charge facility gives you 45 minutes use from 15 minutes charging. Although perfect for the gym or home, I don't consider these great earbuds for running outdoors, or cycling. The fit is brilliantly comfy but less unshakeable than the Jabras, which is off-putting if you hit the ground like a runaway giraffe, as I do. The way they protrude also makes them impossible to wear with your hood up in winter, as they will catch on it. The real problem with the way they protrude, however, is wind noise. They whoosh quite a bit in a breeze and in a high wind, I'd go so far as to say they are unusable. However, the weird fit is also why they're so comfortable, and with notably better audio than Jabra's Elite 65t, and a more unshakeable fit than the RHA true wireless, the SoundSport Free are among the very best true wireless buds for the gym and other sports where no wind is likely. Yes, you look a bit stupid wearing them but, come on, you're working out – you probably already look daft. The Monster iSport Victory Wireless headphones are an interesting counterpoint to the NuForce BE Sport3 and Sennheiser CX Sport headphones. Overall there's not a great deal to tell between them, and your choice could boil down to whether you value sound quality or firm fit, and what this week's best prices on each happen to be. Thanks to a wide range of tips and wings, the iSport Victory can be made to sit pretty much unshakeably in your ears. As such, although they are slightly less comfortable than their NuForce and Sennheiser rivals, they are arguably better suited to really vigorous exercise. They also pair via Bluetooth more quickly and reliably than the NuForce, with a clear voice announcing the battery level (high, medium or low) as well. On the other hand, this is less musically gifted than its rivals, with Monster going for a more standard 'pumping' sound. But then, to be fair, most people don't listen to Vivaldi or Andrew Bird at the gym, and they do sound suitably 'motivational' when pumping out bass-laced power tunes. I just wouldn't use them for general, non-exercise-related listening, which I do with the NuForce. One other thing to note: they actually only sound suitably motivational, pumping (etc) so long as the 'Sport' mode is activated (by pushing down both volume controls for a few seconds). In standard, 'Warm Up' mode they're a bit weedy. As I felt the need to permanently keep it in Sport mode, battery life also suffers slightly, although you still get a good 6-7 hours per charge. I didn't necessarily expect much from the Urbanears Stadion headphones from hipsters' favourite, Stockholm's Urbanears. However, this is actually a great pair of headphones for running. Because the Stadion has a solid (but not uncomfortable) neck band, and springy, coiled cables, running to hooked earbuds, it pulls off the unlikely feat of an unshakeable fit, without totally blocking out the world around you. Personally, I don't like hearing the world around me, but I know many runners and cyclists would like to be able to hear large, wheeled objects bearing down on them when on the roads, and some people, more bizarrely, even want to be able to hear the ambience of their local gym. Well, the Stadion is just the ticket for those people. Add perfectly decent audio (the fact that a dose of ambient sound is allowed in means that by definition it's not amazing), plus 7 hours of battery life per charge and a choice of attractive colourways, and you have a winner. I can even forgive the bizarre design flaw that plants the control buttons, mystifyingly, on the part that sits directly on the back of your neck, thereby rendering them almost entirely unusable when you're running. Bose is yet another competitor in the 'lightweight buds joined together with a short wire' gym-and-run headphones stakes, and the Bose SoundSport Wireless pair of headphones is, again, very good. However, like the Sennheiser offering it's also somewhat more expensive than NuForce and Monster's takes on the style. That aside, I don't really have a bad word to say about the SoundSport Wireless. Sound quality is very solid and you could use them outside the gym or after a run quite happily. They also pair and fit very well. The usual, pleasingly forceful Bose sound quality is present, and the overall package is sweatproof, reasonably rugged and unfailingly comfortable. My only reservation is that the marginal gains over the Monster and NuForce sports headphones are not sufficient to justify the price, which tends to be considerably higher. If you really don't want to block out external sound, you can't get much better than a pair of 'earphones' that don't even sit in your ears. Aftershokz Trekz Air follow on from the older Titanium model and are 20% lighter, but the way they work remains the same. Sound is transmitted via bone conduction, from just next to your ear, so as well as enjoying the music, you can hear approaching cars and buses. It also makes it somewhat harder to damage your ears from excessive volume. Early bone conduction headphones were pretty awful, but these ones work, and are a further step up from the – also very good – Trekz Titanium in terms of comfort. By definition, sound quality can't compare with the best traditional headphones, but when you aren't being yelled at by taxi drivers, or beeped at by a truck that's about to run you over, you can enjoy audio that's surprisingly punchy and enjoyable. When there is sound around you, you'll be able hear it very easily. The only slight issue with this is that on a noisy road, or in high wind, you can hear all that sound over your music as well, which is less useful. For those who want tunes but really prize situational awareness, however, this strikes me as a price worth paying. Connecting to your phone via Bluetooth is simple, and the Trekz Air is sturdy waterproof, sweatproof, dustproof and easily portable. As much as the Aftershokz Trekz Air is not for musical purists, for safely soundtracking your cycling or road runs, this pair of sports headphones is hard to beat. A lot of punters moan about headphones from the Apple-owned Beats by Dre being overtly bassy and punchy, but that is no bad thing when you're talking about gym/running headphones. The Beats Powerbeats3 offer rapid pairing with Apple devices via the W1 chip (a sort of typically Apple-esque 'Bluetooth with knobs on' concept) and also pair perfectly fine via 'normal' Bluetooth with non-W1-compatible devices. I enjoyed using the Powerbeats3 a lot; the sound is great, battery lasts a good 10-12 hours and you can also charge them up for 5 minutes and get an hour's play out of them – very handy at times. On the other hand, I found the ear-hook design didn't give as good a fit as the headphones above it in the list, as it tends to wobble up and down when you run or even when cycling hard. The price maybe feels a bit high, given that. For more sedentary workouts – pumping iron, basically – they're good. The Sennheiser CX Sport Bluetooth headphones look an awful lot like the NuForce Be Sport3, Monster Victory and Bose SoundSport, but then as TS Elliott once said, 'talent borrows, genius steals'. These are incredibly light and comfortable, even compared to their light and comfortable rivals and offer excellent audio, once you've got them positioned right in your ears. As they offer an hour's play from just 10 minutes of charging, I can forgive the comparatively brief, six-hour battery life. However, there are two 'issues' here. There's no AAC, so Apple users don't get the very best sound out of it – although even without support for AAC, audio is admittedly excellent. More problematically, you do need to have the CX Sport Bluetooth positioned quite precisely in your ears to get the optimum sonic results. That's fine if you're sat down or ambling along the road, and the great sound means the Sport Bluetooth are more than capable when you're not doing 'Sport'. However, it can be a bit annoying when you're doing one-armed chin-ups or shuttle sprints. Android users will be pleased to know that Apt-X and Apt-X Low Latency (for use when watching films, so speech syncs more accurately to lip movements) are both on board. Overall, these are excellent running earbuds, but ones that could probably use a minor price cut to properly achieve lift-off. Who in their right mind wants to use on-ear headphones when their head is a sweaty mess? I dunno, but I keep seeing such people at gyms, and they would definitely be best advised to fulfil their bizarre needs with the Monster iSport Freedom headphones. Yes, they're bulky compared to everything else here, and the touch controls take considerable work to get used to. But on the other hand they're sweat-proof – which of course they need to be, as you will sweat BUCKETS of ear sweat – and, in fact, washable. They also sound great, and due to being huge, can fit a battery that lasts for 24 long, sweaty, hot-eared hours. 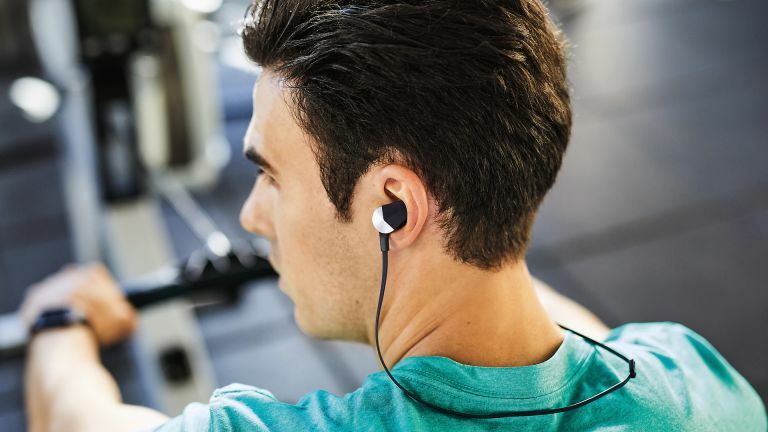 I'm not sold on the concept as you may be able to tell, but if you actually prefer old-school, on-ear headphones to in-ears for gym and running, these are the best on-ear running and gym headphones you can get. If you like to be at the cutting edge of audio-based fitness tech, look no further than the Jabra Elite Sport. I've been using these for about six months and they have really grown on me. The best type of running and gym headphones in recent years has been Bluetooth ones with a cable between them. These are great, but that cable, no matter how securely the earbuds themselves fit, will always snag on the back of your neck if it's a loose fit, or amplify the effects of gravity if it's a tight fit. Either way, having a wire present it irritating. With true wireless buds, that's not a problem: there are no wires. Unlike most true wireless, Jabra's Elite Sport are sealed against sweat and rain but that's only the start of their talents. They also boast uncannily accurate pulse monitoring via the blood moving through your ears and less accurate movement sensors, used to count reps and estimate run/cycle cadence and the like. An Android/iOS app monitors the sensors and taps into your phone's GPS, to keep you up to date with current and average pulse, speed, distance, and even workout intensity, all via voice cues. Where the app tries hard but fails is in trying to sort out an exercise programme for you (to hit goals such as maintaining or increasing overall fitness). I found this didn't work very well at all, as it just never seemed to learn or adjust to my fitness level. Apparently every workout I do is of LEVEL 5 INTENSITY, so I can't ever improve. Yeah, right. But even despite that, I still use these Jabras a lot. Once you get the right size ear tips and hooks on they are totally unshakeable, without too much booming when your feet hit the ground when running. Audio is really not bad, either. For the type of music you listen to while exercising, they've got all you need. They are about as good as true wireless buds get in terms of battery life too, with about 4.5 hours per charge even with all the sensors beavering away. I wouldn't wear them for more than a few hours at a time as they start to get uncomfortable but they're fine for anything short of a marathon. As noted, the pulse tracking seems generally pretty accurate, but you'd probably be better off with a watch.